I came home to Texas after my She Speaks conference focused and ready to do whatever God had in His plan for me to do. I had the interest and business card of an assistant publisher to one of the most well-known Christian publishing houses. I had notes. I had new books. I had plans. Here it is, two months later. And I have yet to email the publisher, even though she is awaiting my blog link, samples of my outdoor columns, and a possible idea for a book. I purchased mp3 recordings of several of the conference lectures, and have yet to download them. What in the world happened in the interim? A lot. After returning to KY after my conference, the boys and I hurried home, where we spent less than 48 hours before heading north to KS for several days. It was a tough trip, and coincided with the one year observance of Mark's death. He, of course, is buried there. His mom's farmhouse was in the process of being emptied, so it can be readied for rental. In a previous lifetime, Mark and I were going to retire to that house. Plans changed drastically. Made it back to TX again around the first of August. I think it took a good two weeks for us to get everything unloaded from our travel vehicle, much less put away. With school on the calendar for the 27th, we kicked it into high gear, buying school supplies and necessary clothing items. You see, my boys grew quite a bit this summer, so most all of their clothes and shoes were too small. In the midst of my day to day existence, I injured the ankle, and was put out of normal commission for almost two months. When I read all of these reasons above, it just makes me shake my head. Life got in the way. It got in the way of pursuing what I know, deep within my heart of hearts, God wants me to pursue. There will always be excuses to keep from doing what needs to be done. There are innumerable household projects to be completed. Two boys' bedrooms must be emptied completely so that painting can occur. New furniture awaits in Home Zone's warehouse, waiting on my call to give the thumbs up to deliver. Old furniture must be dissassembled and either given away or taken to a storage unit. By the way, I am now paying rent on storage units in two states--Kansas and Texas. What in the world is up with that? Whenever housing is built for us in Kansas, I'm hoping to consolidate the storage contents and get rid of both rental units. Normal fall activities have begun, including orchestra and piano for Ben, and school choir for AJ. Both are involved in church on Wednesdays, as am I. One look at our calendar shows that we tend to be overbooked, no matter how hard we try to do otherwise. And my house? Clutter. Clutter everywhere. Storage boxes containing childhood memories of Mark's, office items, textbooks, etc. are everywhere. Boy stuff is in various stages of sorting--outgrown clothes & toys to Goodwill, a few items for nostalgia's sake to storage, and a plethora of junk to throw away. But the clutter is standing in my way. Physically preventing me from following my dreams. My plans that God has for me. Just in the same manner as the former acquaintance raised Cain about my worth as a Christian in July, spreading copious untruths about me before I headed to North Carolina, these inanimate objects, strewn throughout my home, are making me second-guess my dreams today. And just as I decided in July that the trials I went through were orchestrated by the devil to dissuade me from going to NC, I've realized the clutter in my house is doing the same thing...keeping me occupied so that I continue to leave the requests for columns, blog links, book proposals, and syndication packets on the back burner. What am I going to do about it? Well, I think the realization that there is a problem is a big step in the right direction. The world won't come to an end because I have unfolded clothes in a heap on my floor. My boys won't be scarred permanently from temporarily sleeping on mattresses on their bedroom floors, while the new furniture awaits my painting the corresponding walls. I will do more of what I know I should be doing. Praying. Studying my Bible. Reading some of those wonderful books I brought back in July (one on organization of clutter is a God-send! )> Spending quiet time, each and every day, just sitting still and listening...so that I can hear when God is talking to me. I want more than anything to keep my heart and mind on Jesus. for everything you need, always giving thanks. I'll keep you posted. Here's to putting God first, even on the most cluttered of days. One year ago today, I posted my first blog entry into An Unimagined Journey. One year, 365 days, over 525,000 minutes. I cannot believe the time has passed this quickly. For it seemed while I was in the midst of it, time practically stood still. I vividly remember telling my counselor that I just wanted to "get through the grief," to get it behind me so I would be better. But I learned the hard way that you have to walk it, feel it, and experience it without hurrying. Hurrying just puts a band-aid on the hurt and the grief. You shove it aside so you can deal with day-to-day life...and when it piles up so high that it spills back into your path, it's not pretty. So, to deal with the intense, raw, all-encompassing grief of losing my spouse, I came here. Here, in this format, I've laid it all out on the pages. The good, the bad, the scary, the sweet, the poignant, and the funny....I have held absolutely nothing back. Maybe it's been a case of "TMI" (too much information) at times, and if so, I sincerely apologize. I just wanted a way to pour out my thoughts and feelings, and this blog has most definitely served that purpose. 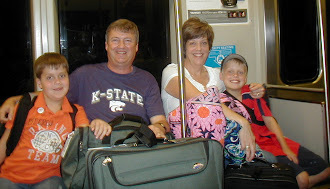 The higher purpose for this blog was for documentation of our journey for my sons. I hope that someday they will read these entries and see where we were, the three of us, after such a devastating blow. And they will see the hand of God in it all, even whenever we felt we were being swallowed by grief and pain. God carried us, and He never has let us down. This one year mark is big, and we are doing better than I could ever dream we would be at this juncture, considering where we were. I go back and re-read some of my early entries, and it's almost an "out of body" experience for me...I remember those times, and I know I wrote those words. But the majority of the time, I sit and the words pour out of me--and I really don't remember composing them. Is that crazy? Sometimes, I feel the same way about my weekly newspaper columns. All I can conclude is that God is supplying me with the words, and I am just His conduit. Looking at the bigger picture, I have come to the realization that there are many women out there in similar circumstances, widowed, either with or without young children. If my words can help even one person in their "unimagined journey" it will be worth my putting all those emotions and thoughts out there in cyberspace. Are we doing well? Yes. Are we fully healed? No. I don't expect us to ever be. If I live to be 100 years old, I will miss my husband and love him, each and every day I have on this earth. My boys will always wonder "what if" daddy had lived as they grow older. They'll mature, go to college, hopefully find two wonderful Christian women to marry someday....but they will always miss the great guy that was their earthly dad. We know there is a plan for our lives. We trust that God is in control. Whenever I see the faith that my 10 and 9 year olds exhibit on a daily basis, it humbles me. They are well-adjusted. They are happy. They still cry on occasion. They remember their daddy and laugh through the tears. They know it's okay to cry and be sad. They aren't afraid to show emotion. Someday the women that fall in love with them will hopefully thank me for helping bring out that sensitive side. My outdoor column for the local newspaper today was my one year summary, as well. Coincidence? I think not. I've decided there's no such thing. There are only "God things." From September 13, 2011 to September 13, 2012---it has been a long journey. A journey of sadness, healing, and rebirth. A journey that has awakened my faith, has given me a new sense of what is truly important in life, and has provided me with a platform to help others in similar situations. I never dreamed I'd be writing an outdoor column or blogging or be part of Proverbs 31 Ministries through A Widow's Might a year ago. But God has plans to prosper my family, and we are beginning to see the fruits of that. What's next for the Howell Party of 3? I have no idea. I wouldn't even dare venture a guess. I hope that it includes plenty of outdoor activities, a chance to continue my writings through a possible book, magazine articles, and/or syndication of my newspaper column. I know that it will include time spent in prayer and worship, as we try to discern what God wants us to do, where He wants us to be, and how He will direct us to accomplish those tasks. We're open and ready for anything. The sky's the limit. I can never thank my love, Mark H. Howell, for providing for us. I can stay at home, be a full-time hands on mother, and still have time to pursue my dreams. He was one in a million, and he was mine. So, tomorrow's another day. But it marks the beginning of the second year of my journey. The healing has taken hold, and we are on the mend. In an earlier entry, I told of a dream I had. There was a beautifully constructed Lego house, with intricate detail, right down to the windows, doors, and fence around the yard. When Mark died, I dreamed the Legos were kicked and broken, strewn around the floor...and I was trying to scurry around and put them back into some semblance of what the structure was before he died. My counselor told me at that time to leave the "Legos" in a pile, and just focus on taking care of my family. I followed his advice. The Legos that were my perfectly-formed life stayed in a messy pile for months. But bit by bit, little by little, I've begun to pick them up. With God's help, I'm building another structure--not the same as what it was before, but structurally-sound and quite lovely in its own unique way. If I can't have the original structure back the way it was, then this one fits my family just fine. The pile is getting smaller and smaller each day, as I find new ways to connect them, to weave the pieces into our "new" normal. and remembering, I keep a grip on hope. How great is your faithfulness! His stockpiles of loyal love are immense." In all the boys and I have been through, we have never lost hope. We have trusted God to provide through the hard times. I have been on my knees, literally, many times in the past year. I don't ask the questions anymore that have no answers. Those questions will have to wait until I see God face to face. I am so thankful for a God that never walks out on me. 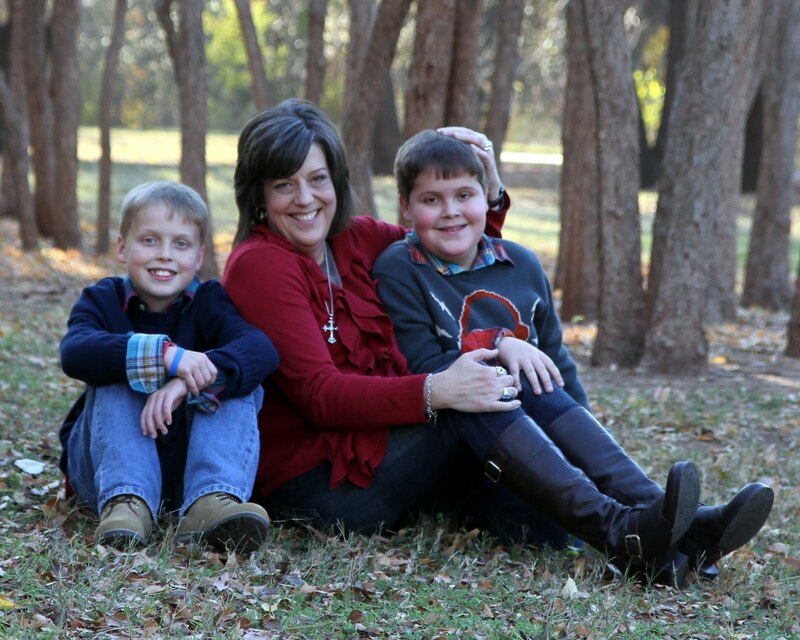 A God who tenderly cares for me and my boys with a vast, deep, all-encompassing love that cannot fail. Wow. I haven't posted a blog entry in over 2 weeks. That's the longest I've gone since I began this journey, almost a year ago. Many things have been happening in my family's lives. The long lazy days of summer, with the three of us being free to sleep in, stay up late, and indulge in just "being" are over. School's entering its third week. Both boys are adjusting well to their teachers, schedules, and the general 5th and 4th grade elementary scenes. A.J. has asked to take the fall season off for sports (he usually plays both basketball and baseball). I personally did a happy dance inside my head, since it really pushes us to do all the practices and games, but I truly do feel that it will be good for him to focus on school without the extra commitment sports take. Ben has started back at piano lessons, and decided to participate in school orchestra. A viola rental is in our (his) near future. We adopted another cat, Milo, from the local humane society. Millie, "Queen of Denial," is having a bit of a time adjusting to this new family member. Milo is sweet, loving, and docile, so I hope that eventually she will come to love him as the rest of us do. Maggie, the wonder dog, accepted him almost instantaneously, as evidenced by her staccato bobbed tail wag. Basically, the boys and I decided that we need some sort of housing on the land in the country. A close high school friend of Mark's has graciously agreed to help me look into the particulars. We did not visit Mark's grave at the church cemetery during this latest visit. It was just too hard in July. We know that's not where he is, anyway, and chose to honor him and his wonderful memory by walking his native grass prairie, checking out his pond, and laughing as we shared Daddy stories among the three of us. In my humble opinion, that's better than sitting and crying at a grave any day. And while in that pasture, the tears come, but they are accompanied by smiles and an occasional giggle, just as he would wish. Also while in Kansas, the boys and I made the choice not to attend Mark's home church for Sunday services. That's yet another "first" I just don't think I am ready for. We saw several church members at a Saturday night neighborhood picnic, and told them as much. Instead, we travelled to a beautiful Lutheran church on the outskirts of McPherson, just at the edge of the country. Mark's younger sister, Amy, was playing organ that day. I've never stepped foot inside a Lutheran church. It was gorgeous. We were made to feel so welcome. There is just something about a small town. There's even something more special about a small church, filled with folks from a small town, all gathered together for the purpose of worshipping God. The boys thankfully didn't choke, and I would've asked for seconds if I could have (sorry, that's a bad joke, one that Mark would've made!). Amy's music for prelude, offertory, and postlude was so lovely. She truly made the pipe organ sing. As I closed my eyes and listened, I imagined that music in heaven must be something like this. I also felt Mark there in spirit. He loved piano and organ music. Know he was proud of his little sister. Since returning to Texas late on Labor Day (on what would've been our 24th wedding anniversary), I hit the ground running and haven't slowed down for much. Thankfully my ankle seems to be healing, and rehab is going well. I am hopeful I can be jogging again in a month or so, but that's up to the doctor. I awoke last Friday morning, September 7, differently than I have since July of 2011. For over a year, I have grieved and cried. I have wished for things to have turned out differently. But little by little, step by step, with the help of my God and my Saviour, a wonderful counselor, and yes, antidepressants, I have begun to heal. I mention the antidepressants for only one reason: if they are necessary, you should never feel guilty for utilizing them. A former acquaintance mocked and ridiculed me publicly on more than one occasion for taking them and going to counseling. There is no shame in either, friends. While I've been in the thick of the grief, in the heat of so many painful moments this loss has brought us, our progress has been difficult for me to see. Thank God for hindsight, for it is there I can see how far the boys and I have come. I have joy. An unexplained joy. On that very morning, with both boys in separate showers, I sink back into bed with my coffee, enjoying the last two minutes of quiet before I'm called to be mom, fashion expert, hairdresser, cook, and chauffeur. And I hear it. Sounds I have not heard in well over a year. BOTH boys are singing. In the shower. In separate bathrooms. Now, I cannot identify the songs, and I don't particularly care what they are. The big thing is they are singing. They, too, are feeling joy. I cry tears of joy. Thank you, God, for showing us that there is joy on the other side of grief. That there is healing in the midst of intense pain. That good things can come from bad circumstances. That we can wake up with a joy that just cannot be explained. That two little boys can come through losing the most important male in their lives and still be happy enough to sing in the shower. We have so much to be joyful about. We know love of close friends, of family. Of a church that has stood by us and has not let us down. "God's power protects you through your faith until salvation is shown to you at the end of time. This makes you very happy, even though now for a short time different kinds of troubles may make you sad. These troubles come to prove that your faith is pure. You have not seen Christ, but still you love Him. You cannot see him now, but you believe in him. So you are FILLED WITH A JOY THAT CANNOT BE EXPLAINED, A JOY FULL OF GLORY. " The subtitle above this chapter simply says, "We Have a Living Hope"
My unexplained joy has been explained, by the beautiful, articulate words of Simon Peter. I am hopeful for my family's future. I will never forget where we were whenever God reached down and carried us. But now I feel ready to try to walk it on my own again, as long as God's right by my side. There are exciting possibilities on our horizon. All made possible by no one else but God. It is my prayer that you, too, find that unexplained joy. God is greater than any pain you find yourself in. Amen.